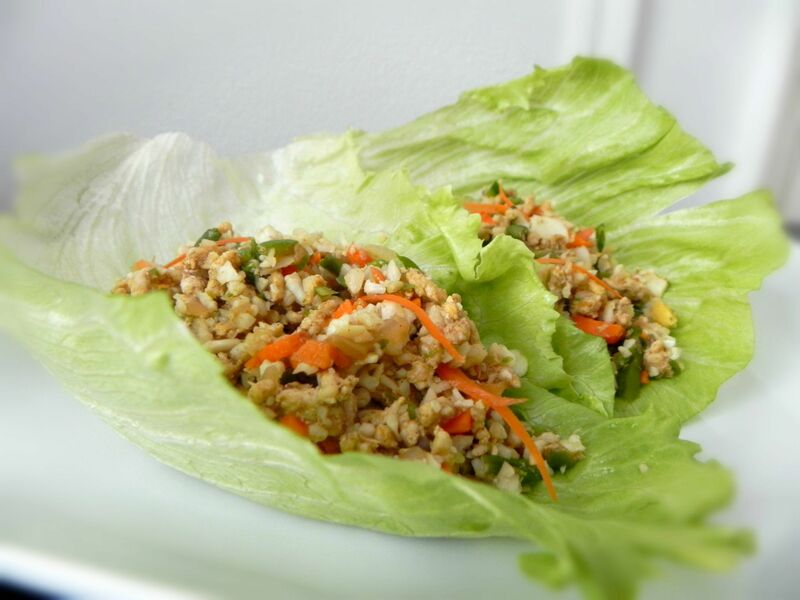 These lettuce recipes are an excellent balance of protein and fat. They have a moderate amount of carbohydrates so serve them with 1/2 a serving of grains or fruit to keep your meal balanced and to stabilize your blood sugar. Place vegetables, onion, ginger, garlic, and water chestnuts into a food processor and chop into small pieces. Set aside. Add ½ cup vegetable broth to wok or skillet and place over medium-high heat. Add turkey and cook until no longer pink, about 10 minutes. Reduce heat to medium and add cauliflower, vegetable mixture, and sauce. Cook for an additional 4-5 minutes, stirring frequently. Note: If mixture starts to stick to pan add more vegetable broth one tablespoon at a time. Garnish with additional chopped water chestnuts, if desired, and serve with lettuce leaves.